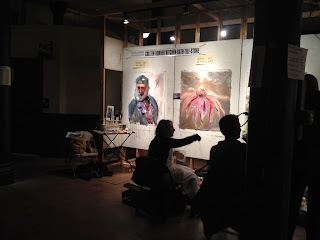 This year I was invited to participate in Open Canvas in Milwaukee, WI. Open Canvas is a popular fundraiser that benefits scholarships for local students. It's invite-only, so I was excited to be asked late last year, even if I had absolutely no idea what I was getting myself into. It's quite an amazing event. It takes place in the Pritzlaff Building, a recently renovated warehouse just off the river. 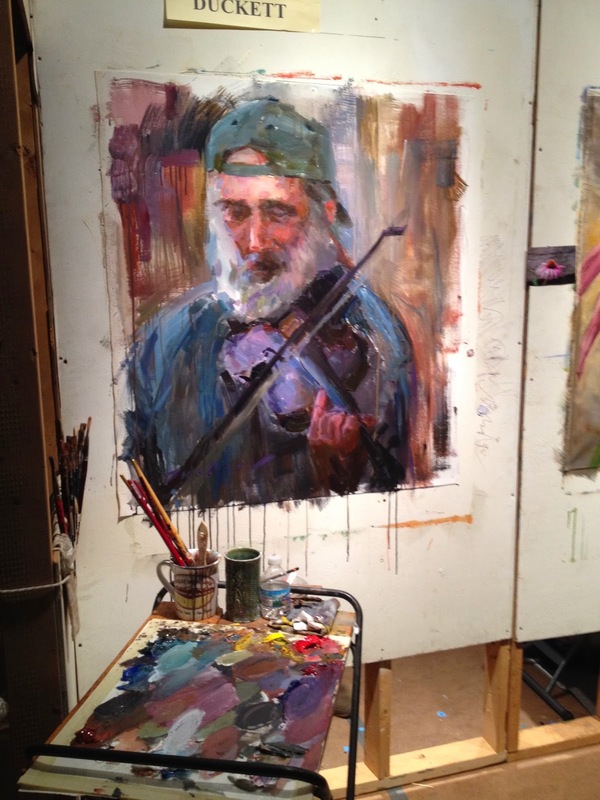 Almost 80 artists were invited this year from around Wisconsin and Illinois. Artists are supplied paint and a 48" x 36" canvas, and are given about 9 hours to paint. My station shortly after arriving that afternoon. My two neighbors also happen to be Chicago artists. Artists work with acrylic paint, and can use any subject matter they wish. I figured I'd use a photo of my friend Tim, and hope that I could manage the acrylics. While artists work, collectors and patrons can stroll around and watch the myriad works manifest. Also, they had like 25 or so restaurants catering and a bar, all on the house! Since my paint would dry quite quickly, I took the opportunity to work with vivid, broken color. And the scale allowed me to work with large brushes and bold strokes. My booth shortly after starting, and eating a ton of food. Once I got started, time flew by, and I didn't get much of a chance to check out many other artists. Before I knew it, the sirens were going off signaling the end of the allotted painting time. The works are auctioned off silent-style, and, one by one as the pieces close they are sold to the highest bidder, and in some cases a bidding war erupts in the final moments. Quite an exciting event to be sure, and I really had no idea how the night would unfold. My work was fortunate to be in such a bidding skirmish, while I obliviously knocked in the final details. Here's a rough cell phone picture of my work at the end. The lights were a bit hot, so the color is a tad blown out. It ended up being a little less vivid. If I can get a better picture I will post it. That taboret is my poor liquor cart from home. It held up to the soggy paint rags and messy palette quite well. I had a great time. I met so many great people, and everyone was so positive and excited and intrigued by the artwork. Lots of people asked me about Tim throughout the night, and he proved to be a very popular painting. I hope to be a part of the event again next year.